Sometimes my kids make me feel like a creative genius. Take today for example; it was hot out and everyone was just a little bit tired and slowly getting to cranky. Mama served up this simple summer treat of cantaloup "boats" with spoons to dig your way through ’em. They thought this was a grand idea and got to work right away. Only thing is these melons are way bigger than the ones my grandmother would give me when I visited her in Brittany as a child and the kids could barely get more than half-way through ’em. "Today is the best day ever; no one’s yelled at me or anything!" Not ten minutes later we discover his new bike had been stolen. So much for having a great day… grrr. here in Australia we call them cantaloupes in the southern states and rockmelons in the northern states…very confusing. 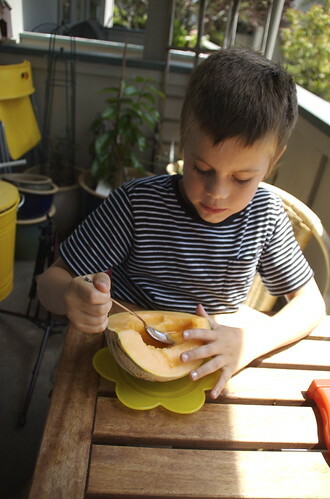 My son loves all types of melons and even though he is only 4, i think he could eat a boat like that no worries. yum.